If I ever doubted that garlic is a member of the lily family, I am a skeptic no longer. The bulbs tend to garner the bulk of the attention when we think about the stinking rose, but these lovely “garlic flowers”–as the sign at the farmers market identified them–caught my eye with their crooked necks and curling tendrils and delicate white seed pods. More commonly known as garlic scapes, these twisty garlic tops are only available for a short time, usually in late June around here. Farmers tend to remove them to improve bulb development, and the stems are often discarded, which is a travesty because they taste so good. Scapes are easy for any garlic fan to fall for. Their flavor is pleasantly reminiscent of the familiar bulb, but it is simultaneously brighter and more delicate. They are lively and tender and incredibly green. They have plenty of snap without garlic’s characteristic bite. After the white pods have been removed, the stems can be sliced and sautéd or or steamed and added to stir fries or salsas or sprinkled on salads. Or at least they can in theory. I wouldn’t really know, and I’m unlikely to find out because I see no point in using them for anything but this pesto. This is a fantastic way to dress up plain ol’ pasta. It would be lovely on pizza or bruschetta, and it also makes vibrant dressing for a bowl of greens. I thought it was lovely over a simple bowl of penne with sautéd mushrooms and asparagus. This comes together in maybe five minutes, if you need to take two minutes to dig out the food processor and another two to grate some parmesan cheese. Just about every source I’ve encountered that mentions garlic scapes offers a variation of this pesto. 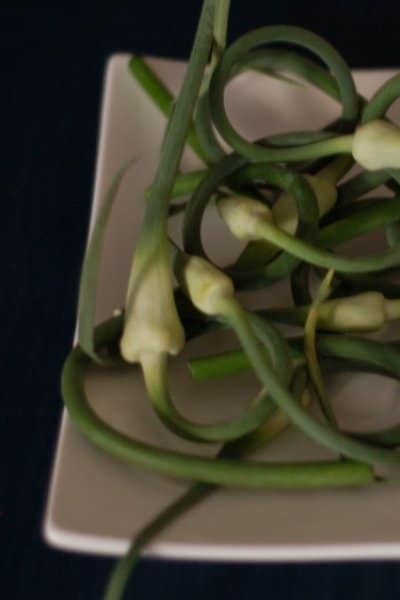 Scapes can vary in pungency and astringency (as does personal tolerance for those qualities). More delicate scapes might balance well with less cheese, and might even benefit from the addition of a little lemon juice. Older scapes might fare better when matched with a little more cheese and might benefit from the addition of almonds, walnuts, or pine nuts. This is a good starting off point. Feel free to improvise. Put everything into the bowl of a food processor and blend until it forms a bright green paste. Taste and adjust seasonings if necessary. Store in an airtight container in the refrigerator for up to a week, or freeze for several months.